Family bonding can be healing for a multitude of reasons including, but not limited to: helping to navigate change; enhancing communication; building teamwork; enhancing social, emotional and intellectual success; problem solving; improving concentration; improving decision making; providing comfort and security; building self-esteem; teaching practical skills; increasing physical ability; teaching values; increasing curiosity; building self-discovery; creating a sense of identity; increasing playfulness; improving kindness; and generating wonderful memories. Thus, it is important for your family to establish a regular time to bond. Attitudes are contagious, so try not to see this as another thing on your to-do list. Try to be positive about family times. When the family is involved in an activity, they are more apt to open up about things they might not normally discuss. It might be difficult finding activities that help facilitate family bonding. Everyone might not want to be involved. To help facilitate involvement, you can try asking those most resistant to pick the movie, activity (game, craft, etc. ), or snack. However, that may not work well for those who are anxious, since they might feel they are being put in the hot seat. If you notice someone is anxious or struggling with making a decision, you might suggest they select three choices and ask another family member to make the final decision, or for the family to take a vote. You may need to give some incentives to participate such as not having to do a chore, getting an extra half hour or hour of TV time, a bonus bedtime story, or getting to stay up an extra half hour on Friday night. However, if the family activity becomes too competitive and there are some who never win, you might change the prize to a family reward earned after everyone participates. Some families may benefit most from cooperative games rather than competitive games. The ultimate reward is connecting as a family, having fun, and creating lasting memories. The Reed and Kittle families enjoy playing Rory’s Story Cubes where a story is created round robin style with each family member adding an aspect to the story. This type of activity creates connection and conversation. If someone is struggling to come up with an idea of what to add to the story, then another family member could provide a suggestion. This type of activity also emphasizes the importance of taking turns. Some of the stories can also be pretty funny, and laughter is a great way to facilitate bonding! (There are many ideas on Pinterest for printing pictures to use to tell stories as well). Another fun activity is to work in pairs or teams to write step-by-step instructions on how to do something (e.g., how to make a PB&J sandwich). Select one set of instructions and see if the family can accomplish the task using ONLY the steps provided such as: 1) Locate the bread; 2) Untwist the tie and open the bag of bread; 3) Remove two slices of bread; (You cannot use a plate if it did not say to open the cabinet door and get a plate!) All family members can help monitor whether the task can be completed correctly or not. If that task cannot be completed because steps are missing, start over with another set of instructions. You might want the entire family to collaborate in writing step-by-step instructions and then see if the task can be completed effectively together. Mementos from family get togethers that highlight the family’s laughter can be saved and displayed to encourage positive reflection on family time. For example, save a funny family drawing from Pictionary and display it in a prominent place, or display the answer sheet from Scattergories with a note that says, “Do you remember all the creative answers Mitch came up with for the letter ‘z’?” Perhaps, you can decoupage and frame a puzzle you finished together or display a mosaic or artwork the family created. Maybe create silly captions for family photos and display the favorite. Families with younger children might enjoy blowing up a balloon and hitting it back and forth to one another. You could even make paddles out of paper plates and hit the balloons to one another with those. Yoga might be an activity everyone can try and encourage one another to do different poses. Remember laughter is a great way to facilitate family bonding. 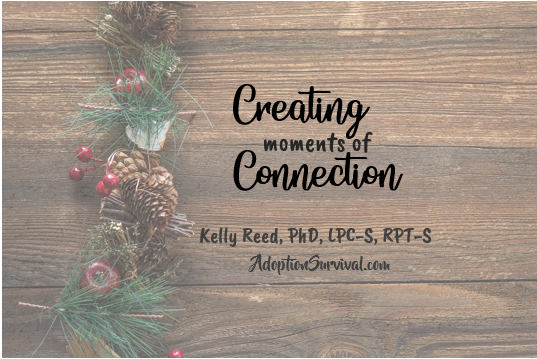 Our book contains many other ideas to facilitate family connection, including lists broken down into Doing Tasks, Artistic Tasks, Writing or Verbal Tasks, Family Outings, and Games You Can Play.